Our high quality baby sleeping bags, also called wearable blankets, are available in three different sizes from infants to the hard to find toddler size common to Europe. Whether you are looking for a practical baby blanket for yourself, a unique baby gift for a friend's baby shower, or are a proud grandparent, a BabyinaBag will meet your individual needs. Used safely in Europe for over 25 years, baby sleeping bags ensure that your child is always covered and warm, regardless of how actively they may sleep. Baby sleeping bags are the safer, more comfortable alternative to traditional loose baby bedding. Designed as a wearable blanket, a baby sleeping bag keeps your baby comfortable and warm all night long, so you'll sleep better too! Is your baby sweaty in their sleeping bag? Synthetic fibers like fleece and polyester absorb moisture in very small amounts and hence are the least desirable fabrics touching your babies skin. With our bags, only soft jersey 100% cotton touches your baby's skin, allowing for as comfortable sleeping experience as possible. If babies are comfortable, they tend to sleep longer. So enjoy that extra rest! 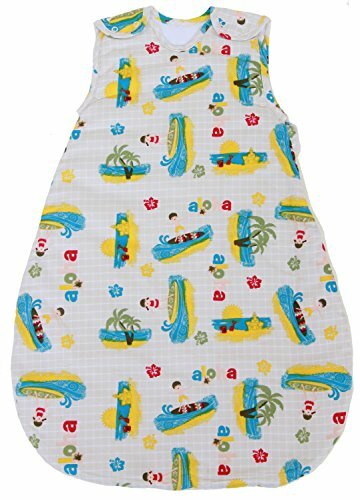 HIGH QUALITY: This is a very warm 2.5 Tog winter model baby sleeping bag for room temperatures below 70 F. 100% woven cotton outer shell and very soft 100% jersey cotton inner lining. SAFE SLEEP: Your baby is covered and warm all night. No more kicked off covers means your baby sleeps more comfortably. Available in three sizes: 3-11, 10-24, and 24-3T months. PRACTICAL: Adjustable armholes for superior fit. Side zipper with open and fold-flat design for easy diaper changes. Machine washable and can be tumble dried on low heat. SPACIOUS: Generous bell shape sack design allows ample room for kicking, but cannot be kicked off so baby stays warm all night. Sleeveless design reduces the risk of overheating. WINTER WEIGHT: Soft poly fill for more warmth. The recommended nursery nursery temperatures should be between 58F to 69F. A Baby Sleeping Bag surrounds the baby, providing insulation from both below and above, and also a warm pocket of air around the baby. If you have any questions about this product by BabyinaBag, contact us by completing and submitting the form below. If you are looking for a specif part number, please include it with your message.